There are many causes of bladder stones. In female dogs, struvite stones are the most common and are usually due to chronic bacterial bladder infection. Some types of bacteria breakdown urea in the urine to form ammonium, which is a chemical component of struvite stones. Calcium oxalate stones are most commonly found in male dogs and cats and form due to a condition of the kidney that promotes oxalate excretion into the urine. Certain breeds, such as schnauzers, are more prone to have this problem. Oxalate stones may also form if the pet has a tumor of the parathyroid gland or another type of cancer. Ammonium biurate stones form if a pet has a liver disease, such as a congenital condition called a portosystemic shunt (vascular abnormality). In such cases the liver is unable to clear the blood of uric acid; thus stones form. Surgical correction of the shunt usually prevents the stones from recurring. Dalmatians lack an enzyme called uricase in their liver and kidney cells that results in the accumulation of high levels of uric acid in the blood, which causes the formation of urate stones in the kidneys and bladder. Clinical signs of bladder stones may include straining to urinate, passage of blood-tinged urine, frequent urination, and having urinary accidents in the house. 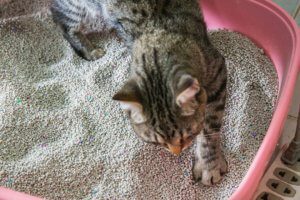 If a stone has passed into the urethra (the tube that extends from the bladder to the outside), the pet may not be able to produce any urine or only pass small dribbles of urine. This sign should not be ignored as your pet could die from urinary obstruction. Your veterinarian will take radiographs (X-rays) of the abdomen to identify stones that may be within the kidneys, bladder and urethra. Some stones are visible on X-rays, yet others cannot be seen. In such cases, a dye (contrast) study or ultrasound of the abdomen may be recommended. Blood testing including a complete blood cell count and chemistry profile are used to check the health of the internal organs prior to surgery. Fasting and post-eating bile acids testing may be performed if a portosystemic shunt is suspected. Urine testing, which also includes culturing the urine for bacteria and antibiotic sensitivity, is very important. If there is a strong suspicion that struvite stones are present, based on previous test results, a prescription diet and antibiotics may be recommended. Stone size is monitored with biweekly sequential X-rays. The stones should dissolve within two months after initiating therapy. In some cases, surgery will be recommended to remove the stones. An incision is made on the lower part of abdomen to expose the bladder. Then, an incision is made into the bladder, stones are removed, and the bladder is flushed multiple times to ensure that all stones are successfully removed. Alternatively, hydropulsion, a nonsurgical form of stone removal, which involves filling the bladder with saline and manually squeezing the bladder to expel the stones, can be used in female dogs and cats with small bladder stones. After surgery or hydropulsion, X-rays or ultrasound examinations are performed to ensure that all stones have been successfully removed. Laparoscopy is a minimally invasive surgery (and less painful than traditional surgery), which involves making a very small incision in the lower abdomen to remove stones. This treatment method also allows the surgeon to fully examine the bladder for other problems and confirm that all stones have been removed. If the bile acids test, ultrasound, and/or other special tests support that your companion has a portosystemic shunt (vascular abnormality) that is causing the stones to form, an exploratory surgery to identify the shunt will be recommended. A band is placed around the shunt vessel, which will gradually constrict the abnormal vessel over a period of six weeks. Stones are analyzed by a lab to determine their type. With this information, treatment (medication with or without a special diet) will be recommended to help prevent stone recurrence. Dalmatians usually require a special diet and medication (allopurinol) to prevent stones from developing again. The most important treatment to prevent stone recurrence is to increase water consumption. The prognosis following stone removal is good, provided that preventive measures are taken to help prevent stone recurrence. Oxalate stones may recur in spite of medical therapy in some breeds. 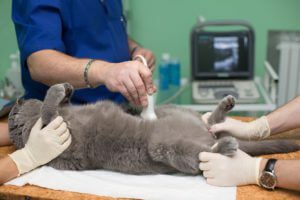 For this reason, X-rays or ultrasound of the bladder should be used to evaluate stone recurrence every few months at your primary care veterinarian’s hospital. If the recurrent stones are very small, nonsurgical hydropulsion can be used to remove them.